Any actor or producer will tell you, moreover, that teachers are the worst offenders. 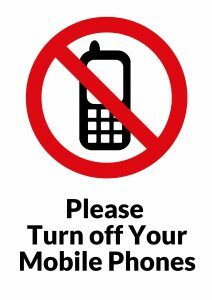 They arrive with their school parties who are all strictly instructed to turn their phones off and put them away. Then, far too often, the teacher proceeds to fiddle around with his or her phone throughout the performance thereby conveying to the pupils the message that theatre is OK for kids but when you’re grown up you have more important things to attend to. I’ve even seen teachers active on full size I-pads, completely ignoring the performance they’ve brought their students to see. So what exactly are these “flashers” doing? Some are glancing at the time and wondering how long it is before they can get to the bar or loo. Do they not wear watches? Others are checking for messages via text, email or social networking – and sometimes responding to them. Well, I sometimes feel my phone vibrate in my bag when I’m in the theatre. Whatever it is has to wait until the interval or end of the show. Nothing remotely untoward has ever resulted. Well, if concert and show promoters are actually encouraging people to download information in advance then they are actively encouraging the use of phones and tablets during performances. And that’s not on, in my view. Of course it’s a good idea to circulate programme notes so that everyone can be clued up before they come but not if it means they disturb others during the performance. I think some rules need to be laid down. Anyone downloading a theatre or concert programme should be firmly told that reference to electronic access during the live performance is forbidden. Perhaps they could be encouraged to print off the notes if they want them handy at the time? Theatre staff are already pretty vigilant about mobile phone use but, evidently, not watchful enough. Time to spell it out that when we say “no mobile phones” we mean light as well as sound?